This Saturday's sparkler takes us back to the ultra-glam days of the public face of the Iranian monarchy in the 1950s. Here's a look at the diamond and emerald sunburst tiara worn by Princess Soraya, a queen-turned-movie star. Soraya Esfandiary-Bakhtiary was the second wife of Mohammad Reza Pahlavi, the last Shah of Iran. 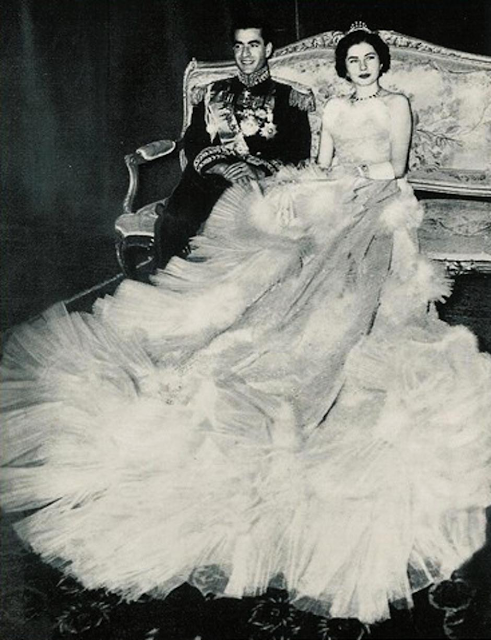 Their whirlwind romance was arranged by the Shah's sister, Princess Shams, who met Soraya in London. The teenaged Soraya, daughter of an Iranian diplomat and his German wife, went to Tehran and was engaged to the Shah within days. He presented her with a 22 carat diamond engagement ring. The wedding was scheduled for December 1950, but Soraya suddenly became ill. It was typhoid. 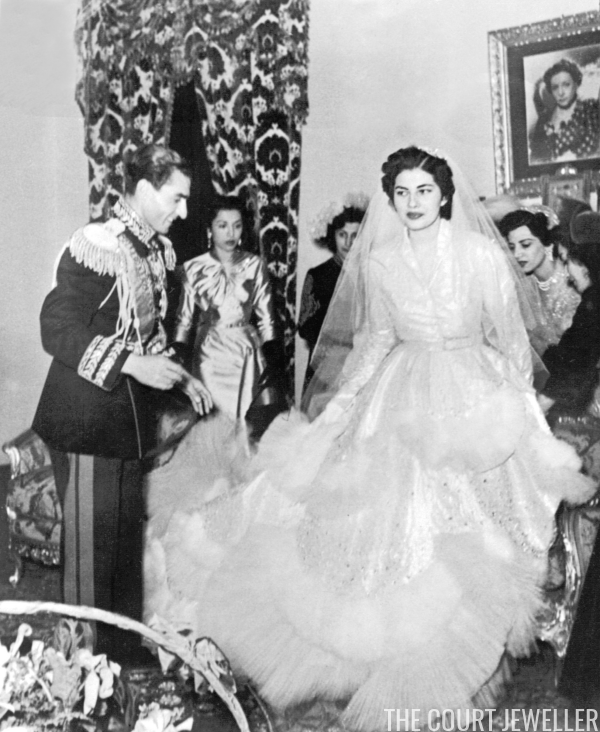 The illness left her so weak that, when the wedding went ahead in February 1951, Soraya had difficulty bearing the weight of her enormous Christian Dior wedding gown. Vincent Meylan explains, "Minutes before the ceremony, the Shah and one of his aides used scissors to cut away eight meters of the train, in order to relieve Soraya of some of the weight. Relieved, the new Queen of Iran could just about remain standing during the reception that followed the religious ceremony." As you can see from this footage of Soraya's arrival for the wedding ceremony, she did not wear a tiara for the wedding itself. Instead, she wore a Juliet cap that was embellished with gems. For the wedding reception and dinner that followed, however, Soraya donned a suite of modern emerald and diamond jewels. Here's a look at Soraya's parure. The maker of the set appears to be unknown, though it has some echoes of the diamond parure worn by her predecessor, Queen Fawzia. (That suite was made by Van Cleef and Arpels.) A similar all-diamond tiara was also worn by Princess Grace of Monaco. The small diamond and emerald tiara sparkled among the sumptuous surroundings during the wedding reception. And here, we get a glimpse of the back of the tiara, as Soraya and her groom move through the crowds at the event. Soraya and the Shah's relationship, though arranged and swift, apparently was something of a love match. But it didn't last. 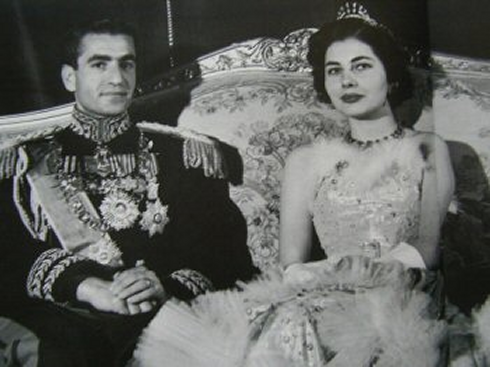 The Shah desperately needed an heir, and when they discovered that Soraya was infertile, the couple divorced in 1958. Soraya was given the title of "princess," but she decided to leave Iran altogether, settling in France. She even embarked on a brief film career. 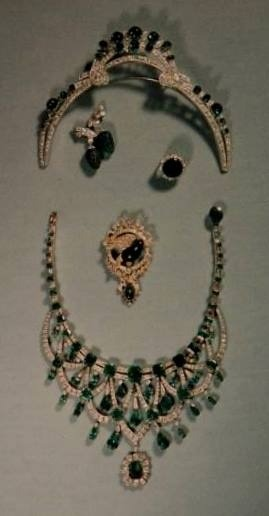 Soraya's emerald and diamond parure, however, stayed behind in Iran. It was worn by several other members of the family, including the Shah's third wife, Empress Farah, and his daughter, Princess Shahnaz. Today, the suite resides in the Central Bank in Tehran, where it is on display with the rest of the country's crown jewels.